This is what it’s all about out here — sheep, fiber and gardening. More than just wool, these beautiful creatures keep this property in fairly good shape. They gobble up stray blackberry vines, keep Scotch Broom at bay and boost fertilizer levels in the soil. Whether it’s making a fire break or clearing coyote habitat this excavator is an essential to making the workload disappear. What would take me weeks to complete, this marvel machine will do in half a day, if not sooner. All month long this yellow workhorse has been out there everyday — shaping the land, taming evasive weeds and keeping the herd safe from predators. This year all my farming tricks are falling flat….literally. My usual green pasture is nonexistent — barren topsoil is the norm out there. It’s easy to blame the summer drought — 140 days without rain, but with all the seed and mulch I’ve dropped the results should have already started to show. I guess it will be up to the Spring weather to work some magic out there. Last week I noticed a wounded hawk hobbling around the back sheep pasture. The bird couldn’t fly and would have become a coyote snack over the weekend. I set out some food, water and an elevated platform which he might reach if attacked. Fortunately, some good news..! A few days later, the injured hawk was attempting short flights around the pasture — dining on grasshoppers and small frogs. 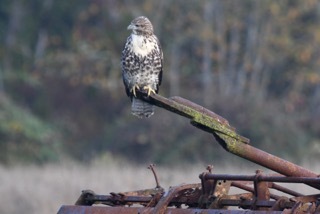 An update: the hawk is back to normal — flying around all the pastures…..a very lucky break.